It's time for another episode of 205 Live on the WWE Network! It's now time for the semi-finals in the Cruiserweight Title Tournament. In the second and final semi-final match, Mustafa Ali will face Drew Gulak. Who will move on to face Cedric Alexander in the finals at WrestleMania? Tune in for all the details after Mixed Match Challenge ends on Facebook Watch. 10:22 PM: Last week on 205 Live, Cedric Alexander and Roderick Strong had an intense match to determine the first man to enter the finals in this Cruiserweight Title Tournament, and Alexander is the man who got the victory. Tonight, Mustafa Ali faces his old nemesis Drew Gulak in the second/last semi-final match in the tournament. By the end of the night we will find out which two men will be battling for the Cruiserweight Championship at WrestleMania in less than three weeks! Vic Joseph and Nigel McGuinness welcome us to the show and echo that exact statement. It's time for a Lucha House Party to get the fiesta started! We get clips from last week where Akira Tozawa and Kalisto had to separate Itami and Dorado post-match. Itami comes out next with Tozawa accompanying him. They lock up, Dorado backs him in a corner, almost a clean break as Itami goes on the attack with a knee and European uppercut. Itami puts him in a side headlock, Dorado tries to counter, Itami holds on tight, Dorado pushes him off, Itami hits two shoulder blocks, Dorado sends him out the ring, fakes a dive with a handspring and dances to the "Lucha Lucha" chant. Itami gets back in the ring, Dorado with a headlock takeover, Itami gets to his feet, backs him into a corner, shoulder thrusts to the midsection, Irish whip, Dorado floats over, slides under, leapfrogs, jumping hurricanrana, dropkick, Itami rolls out the ring, so Dorado hits a corkscrew plancha. Dorado with a chop, throws him back in, gets on the apron, shoulder to the midsection, slingshot headscissors, then back to the headlock takeover. Itami rolls him on his shoulders getting a 2-count, gets to his feet, pushes him off, misses a clothesline, hits a knee to the gut, then lands a running boot to the face knocking him off the apron. He shoves him back-first into the edge of the ring, throws him back in, kicks him while he's down, taunting him, and slaps him across the face. Dorado slaps him back, palm strikes, hits a spinning heel kick, springboard crossbody, palm strike, handsprings, but Itami blasts him with a clothesline and covers for 2. Itami hits quick strikes, charges at him but Dorado hits him with a superkick. Dorado side-steps him, knocks him off the apron, Kalisto and Gran Metalik are close by, Itami shoves Metalik, gets back on the apron, Metalik pulls Itami off the apron and shoves him backwards into the ring apron. The referee sees this and calls for the bell. WINNER by DQ: HIDEO ITAMI. Akira Tozawa holds Itami back while Kalisto tries to keep a cool head holding back both Dorado and Metalik. Both sides hold their men back trying to keep the two separated. We get a video package for Drew Gulak, starting when new 205 Live General Manager Drake Maverick called him a goof. That name-call lit a fire under Gulak and that made him get even more serious and hit harder. Drew Gulak wants to prove to everybody that he can be a success, pin or submit whoever gets in his way, and go to WrestleMania to become the Cruiserweight Champion. Backstage (in some confessional booth), Cedric Alexander sits down and says last week was the greatest moment in his career, but realizes that his dream is not over because he has one more match to make his dream a reality. 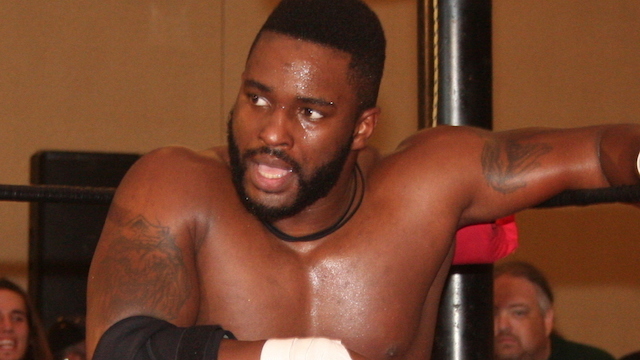 Kenneth Johnson was a competitor in the Cruiserweight Classic, making his debut on 205 Live. In an Instagram video, TJP claimed that he will be the next champion after the winner of the tournament. TJP with a rear waistlock, mat slam, single-leg takedown, side headock, shoulder block, elbow to the top of the head, and a leaping back elbow. Johnson puts his boot up in a corner, TJP catches it, hits a European uppercut, delivers a suplex, spins around, hits a back suplex, gets on the apron, hits a slingshot senton, and takes a bow. Johnson kicks him, side-steps him in a corner, hits a somersault kick, covers for 1, and punches him in the gut. TJP dropkicks him in the knee, kicks him in the leg, shinbreaker, dragon screw, roundhouse kick to the head, hits the Detonation Kick, takes him down and locks in the Clutch Kneebar to make him tap. TJP keeps the hold on for an extra 10 seconds after the bell. WINNER: TJP. Next up, we get a video package for the high-flying sensational Mustafa Ali, first talking about before being a pro-wrestler. He used to be a police officer in Chicago. Now, he wants to prove himself in the ring and change people's minds about him if all they hear is his name. Mustafa Ali is preparing backstage, as is Drew Gulak - their match is NEXT! Backstage, Dasha interviews 205 Live GM Drake Maverick about the first match tonight. Maverick immediately responds saying he is livid about the ending and he wanted a good end to a marquee match. He talks about crowning a new champion at WrestleMania, and adds that the champion will need a challenger soon. He makes a match for next week: Akira Tozawa vs. Kalisto vs. TJP vs. Buddy Murphy. It's time! The bell dings, Gulak is intense, Ali is ready, they circle around, and lock up. Gulak takes the first advantage with a wristlock takedown as we see Cedric Alexander watching backstage. Ali reverses the wristlock, takes him down, armbar applied, Gulak scoop slams him, Ali rolls through and holds on, Gulak backs him into a corner, shoves him, and Ali shoves him back. Gulak puts him in a side headlock, hits a shoulder block, ducks under a leapfrog, drops down, they collide on shoulder blocks, Ali with a side headlock, and Gulak pops him up and slams him down, then puts him in a chinlock. Ali battles out, Gulak knees him in the ribs, Irish whip, Ali ducks, lands a jumping hurricanrana, Gulak pops him back up but Ali dropkicks him in mid-air. Ali backs him into a corner, Gulak holds the holds to force a break, hits a back elbow to the ear, clotheslines him from behind, covers for 2, Irish whip into a corner, Ali hits a back elbow, pushes him into the corner, O'Connor roll for 2, springboards off the ropes, lands on Gulak's shoulders, Gulak counters with an electric chair drop, and bridges for 2. Gulak stomps a mudhole in him, holds him by the jaw, slaps him, palm strikes, Ali retaliates with a spinning heel kick, clotheslines, takes him down then does some ground'n'pound. Gulak charges at him, Ali side-steps him, kicks him in the head from the apron, slingshots back in for a jumping facebuster, covers and gets a near-fall. Ali starts kicking him while he's down, stomps a mudhole him in now, picks him up, but Gulak pulls him face-first into the turnbuckles. Gulak puts him in the Dragon Sleeper, Ali fights out, but then Gulak hits a discus clothesline flipping him around. Gulak picks him up by the arm, clotheslines him flipping him around again, covers for 2, and Ali locks in the KOJI CLUTCH! Gulak tries to pin him, gets a 2-count, Ali keeps the hold locked on, Gulak rolls under the ropes and gets away from him. Ali gets on the top rope, lands a somersault plancha to the floor and starts pummeling him. The crowd chants Ali's name, he gets on the top rope, but Gulak shoves him off and Ali's face smacks on the apron on the way down to the floor! The referee starts his count as we get a replay of it. Ali gets back on the apron, Gulak knocks him off, throws him into the barricade, tosses him back in the ring, but Ali rolls back out the other side. Gulak goes after him, charges, Ali side-steps him and tosses him across the announce table, then Ali dives OVER the table to pummel him some more! Ali slowly gets back in the ring, the ref now starts his count on Gulak, but Ali exits the ring to break the count at 5, and starts to take apart the announce table. Ali brings Gulak onto the table, sets up for a suplex, Gulak punches him in the gut then gives him a back body drop from the table to the ground below! The referee checks on both men then gets back in the ring to start his count again. Gulak goes out the ring breaking the count at 5, smacks Ali's face into the ringpost, then picks him up and scoop slams him into the timekeeper's area! The referee is counting again... 5... 6... 7, Ali is crawling... 8... 9... ALI DIVES BACK IN JUST IN TIME! Gulak picks him up by the hair, goes for the Dragon Sleeper, Ali grabs the top rope to block it, Gulak picks him up onto his shoulders, but ALI COUNTERS WITH A TORNADO DDT! Ali goes to the top rope, Ali hits the 054 (inverted 450 splash), Ali hooks the leg, and ALI GETS THE 1-2-3!! WINNER and Advancing to the Finals at WrestleMania: MUSTAFA ALI! Dasha Fuentes is in the ring to interview the winner about how it feels to be going to WrestleMania. Ali: "Dasha, I'M not going to WrestleMania; WE are going to WrestleMania. My entire life I've had one mission to prove it doesn't matter what your name is, it doesn't matter where you're from, it doesn't matter what the color of your skin is. All that matters is what's IN YOUR HEART!" It's official - Cedric Alexander vs. Mustafa Ali for the Cruiserweight Championship at WrestleMania!